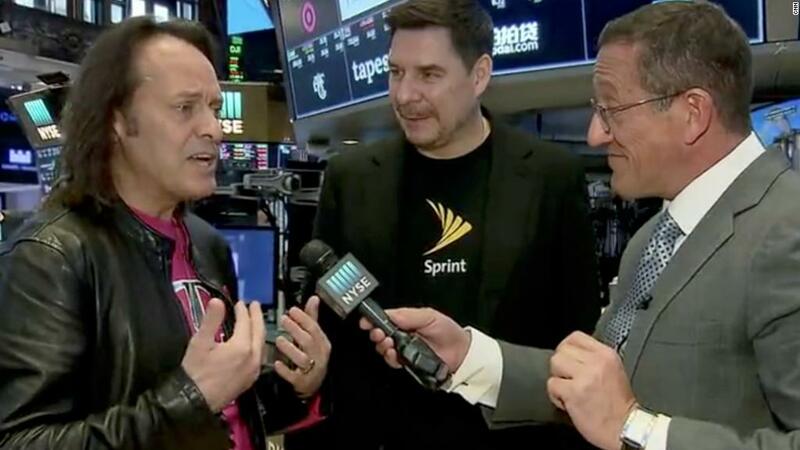 CEOs John Legere of T-Mobile and Marcelo Claure of Sprint were chummy in a video announcing the merger of their companies on Sunday. But over the years, the two have been sparring partners. They run companies that have waged a fierce war for customers over pricing and features. Claure once called Legere a "con artist" and said T-Mobile's Uncarrier marketing scheme was "bullsh**t."
Legere accused Claure of ripping off T-Mobile and told him to "go back to the kiddie pool." If anything can end a competitive feud, however, it's a $26 billion merger agreement. The deal would leave just three major wireless carriers in the United States, positioning the combined company as a stronger rival to Verizon and AT&T. Legere would become the head of the combined company, still named T-Mobile, if the deal passes regulatory scrutiny. The 59-year-old took over at T-Mobile in 2012. He's known for flashy marketing campaigns and a constant social media presence. While no stranger to controversy, the company has thrived under his leadership. Claure, 49, previously co-founded the mobile distribution company Brightstar. He would serve on the merged T-Mobile's board. Legere has been known to level profanity-laced attacks at Verizon and AT&T as well. He dove right in Sunday by referring to the companies in a tweet as "Dumb & Dumber." And Legere doesn't just target his competitors. In 2015, he sparred with President Donald Trump, who had tweeted that "T-Mobile service is terrible!" "Why can't you do something to improve it for your customers. I don't want it in my buildings," Trump tweeted. At the time he had not officially entered the presidential race. Legere lobbed back: "I will serve all customers in the USA openly but I will obviously leave your hotel right away based on this. #checkingout," he tweeted. Legere, who will need the government to approve the proposed merger between T-Mobile and Sprint, said in 2016 that his spat with Trump was water under the bridge. Congrats to the new POTUS, @realDonaldTrump. Let's see what an out of the box, non-typical, non-politician can do for America! "Congrats to the new POTUS, @realDonaldTrump. Let's see what an out of the box, non-typical, non-politician can do for America!" he wrote after election night.